The goal of the Season of Human Dignity is the restoration of human dignity in South Africa. This includes all people in the general community. Where we cross boundaries to reach out to each other, and learn to treat each other with respect and love, we will see the restoration of human dignity for our countries. We know that it is something that only God really can create in our community with people of different languages and cultures. The Lord Jesus is our best example in this. We will focus on stories of Jesus in interaction with various people in the Gospels. 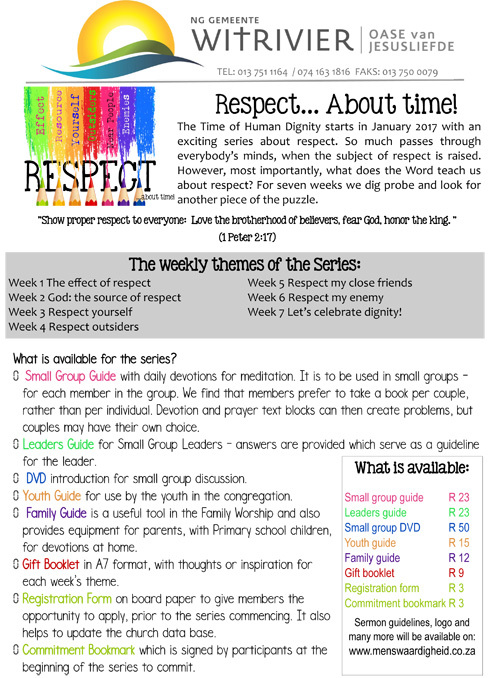 We chose a number of stories of Jesus engaging with men and women to illustrate the values of the Season of Human Dignity: respect, listen, embrace and love. Together, the stories are inspiring examples to follow. Each story of the Gospels is accompanied by a poster that can stimulate the imagination. 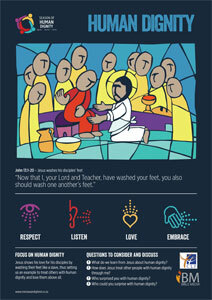 We chose a focus text of the Bible story to help groups to see the essence of Jesus’ engagement. After some brief explanatory comments we give four generic questions that any group can use to unlock the meaning of the story. The four questions can indeed be used for any Jesus story in the Gospels. 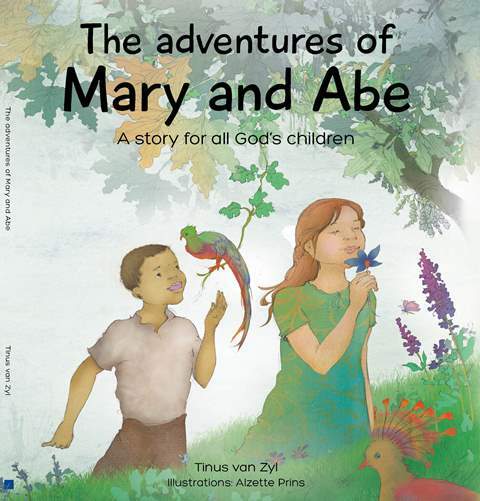 The adventures of Mary and Abe is a story about all God’s children. God’s blue eyed children and his brown eyed children. It is a story that help us to understand that we are all part of Gods’ story – doesn’t matter how we differ from each other. This book teaches children about God – where we come from and where we are going and that each and every one of us can tell a piece of God’s story every day. “Tinus has beautifully told the story of togetherness as it should be understood by Christians. As we taught children about the evil of separation, so should we now teach them about the goodness of unity! This book will help especially those who want their children to have a wonderful sense of unity.” Mvume Dandala – former presiding bishop of the Methodist Church of Southern Africa and a former head of the All Africa Conference of Churches. “This story respects the ability of children to face the complexities of life and to respond to it from a conviction that another world is possible.” Elize Morkel is a clinical psychologist and holds a doctorate in theology. She serves on the executive church council of the DR Church and is chairperson of the national task team of the inter-church initiative, Season of Human Dignity. Two of our own theologians, Prof Christina Landman (URCSA) and Rev Rethie van Niekerk (DRC), will be speakers at this conference with its very, very relevant theme. It is a great opportunity for theologians in South Africa to get inspiration and training in addressing Gender based Violence (which is so prevelent in our South African society) from a biblical perspective. DO NOT MISS THIS!! This publication received the Andrew Murry-Desmond Tutu prize. Elize Morkel, our chairperson, had the privilege of participating together with 19 other theologians from across Africa in the writing of this publication. We are immensely grateful that this book about gender equality and human dignity is receiving this award. Best news is that the whole book is available on-line. You can download it here. The publication Living with Dignity – African Perspectives on Gender Equality from Sun Press will receive the Andrew Murray Desmond Tutu prize this year.The editors are Elna Mouton and Len Hansen from the Faculty of Theology, Stellenbosch University, Getrude Kapuma from Malawi and Thomas Togom from Kenya. This project involved more than twenty scholars from across Africa to discuss important issues of gender equality and human dignity in Africa from different perspectives.